When I heard that Great Escape Games was going to publish a new set of WW2 rules, my first thought was “What niche could these rules possibly be intended for?” followed soon after by “Why can’t we have WW2 rules without German iconography on the cover?”. So I think it’s fair to say that they weren’t on my “to be purchased” radar until a couple of friends of mine brought them home from Cold Wars a couple of weeks ago. Since then we’ve played them a couple of times and I think I have a much better sense of both what the rules for intended for and what the rules do & don’t do well. Given that, I thought I’d write up a review so others can decide whether to take the plunge. I’m trying out a new review format, so hopefully it will help! As an overview, the game uses either 15mm or 25mm figures to simulate company level actions in WW2. Each infantry team represents approximately a squad, each support weapon stand represents 2-3 weapons, and each vehicle model represents 1 vehicle. There is no ground or time scale stated for the game. So generally the game is a level of abstraction above currently popular company level rules like Flames of War, IABSM or Battlegroup. First up is Realism, or how well the game replicates historical decisions and historical outcomes. 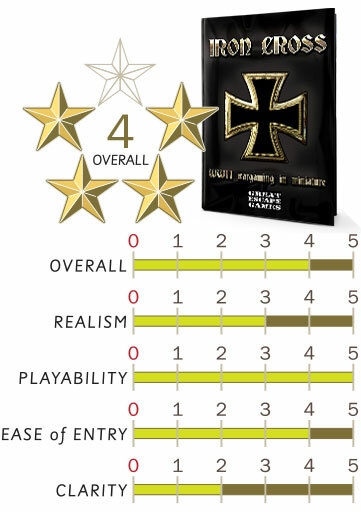 Frankly, Iron Cross is a mixed bag on that front. The command and control mechanisms the game uses is interesting. Each side has a pool of activations, which they can use to activate teams one at a time. Teams can activate more than once per turn, with the first being automatic and subsequent ones being increasingly harder to achieve. The player with initiative conducts activations until he is out of activations or the initiative shifts to the other side. Each activation, your opponent can attempt to interrupt the activation and if he is successful he will get to activate one of his teams prior to you completing the current activation. If the interruption succeeds on a roll of a “6”, then the initiative shifts to the other side. In practice, the system works pretty well and I think is the highlight of the rules. Fire is fairly abstract with most units having a single shot and successful shots inflicting a morale hit with a chance of inflicting an additional hit. Each unit type takes a certain number of morale hits before it is destroyed, with morale hits effecting how well the unit fires and how likely it is to activate. The player may also spend one or more activations in a “company morale check” in an attempt to remove morale hits. So far, we’ve found this makes units pretty resilient, but does allow for a reasonably elegant mechanism for suppressive fire. Where the game falls down is in its lack of organizational information, supporting arms or subordinate command & control. In their defense, the authors stress that the rules are intended for use with historical scenarios, but they fail to provide any in either the rulebook or on line. This means that most players will use the points system and very loose force selection rules, which moves the game away from history and towards tank monster mash. I think this, coupled with the lack of a ground scale, moves the rules to a “3” on the realism scale. On the other hand, the game scores a solid “5” on Playability as long as the scenario doesn’t push the span of command too large. Joe Moore and I played a game with 21 and 24 teams on each side, respectively, and we both thought that was pushing the command system just a bit too far. Thirdly, the game has a reasonably low bar to entry, with the rules costing 12 GBP ($20) and bringing able to existing 15mm or 28mm WW2 figures. The cost is low enough that it really does make sense to give these a test drive and see if they work for you. The only downside is that there is no PDF option, which brings down the Ease of Entry rating to a “4”. One of the rules weaknesses is in its clarity and completeness. The rules are concise, which helps keep down the size and cost of the rules, but are written in a loose, conversational manner. For example, there are no line of sight rules whatsoever, not even a statement that you need to figure it out for yourselves. In some ways the rules seem like a toolkit with some interesting parts rather than a complete set of rules. So the rules earn a “2” for clarity and completeness. Where does this leave my overall opinion of the rules? We’ve played several times and will play more in the near future. Smaller ASL scenarios seem like a good fit for canned historical scenarios for this rules set. They are fun, lightweight and give a reasonable result as long as you don’t ask too much of them. Plus we have a LOT of 15mm WW2 figures that have been gathering dust around here since Flames of War fell out of fashion that might actually see the light of day again soon! That’s enough to earn a “4” overall, despite the German iconography. Fair review. Very much agree with the comment that it’s a toolkit, not a complete rule set. I love the combined command/suppression/morale mechanic but a lot of the rest (particularly the firing mechanic) is a frustrating mess. We’ve had to chuck half the book out and house rule it. There’s the potential for a good game in there, but the book as written has a lot of rough edges to knock off. I agree with your assessment. The local group has so much sunk into 15mm WW2 that since the the Flames of War bug died out they’ve been looking for something fun and easy to make them get the figures back out. There was some hope this might be it, but I’m not sure its doing to hope up to repeated playing. I have hopes for IABSM but I fear its going to be too deliberate for some of the local crew! A good and fair review. We’ve played the rules a couple of times and the lack of clarity did cause us the most problems, particularly the reaction rules and a view visits to the forum finally resolved theses issues. That said they are enjoyable and flow very well and are my go to ruleset. I look forward to their Desert set that is promised.